Singapore is one of the most preferred holiday destinations by Indians. It is the new tourism hotspot. If you’re planning a holiday to Singapore, then you need to begin by applying for your Singapore visa with Musafir.com. The application process for a Singapore tourist visa Dubai visa is extremely simple and requires minimum documentation. You can apply for your Singapore visa for Indian citizens starting from Rs 1,899* and receive it in just 4 working days. For instant Singapore visa assistance, call us at 022-68311010 or fill in your details. The purpose of your visit, duration of your stay and your place of residence will decide the type of Singapore visa you are required to opt for. Based on itinerary, plan and purpose of visit, you can opt for a Singapore tourist visa with a validity of 30 days. Since Singapore is a financial hub in a global perspective, many entrepreneurs and business tycoons visit the country for business purposes. A Singapore visa is required for the same; this visa is different from the regular Singapore tourist visa. If you want to establish your business or company in Singapore, the country welcomes you to do so by granting you a Singapore business visa. The validity of this type of visa is for a year long. However, there are certain aspects including rules and regulations associated with this type of visa. Note: *An additional service charge is applicable. Original covering letter from Indian company addressed to 'The Visa officer Singapore Consulate'. Invitation letter from overseas company addressed to 'The Visa officer Singapore Consulate'. If the applicant's documents have to be collected from Mumbai, an additional courier fee of Rs 300 will be applicable. In case of places other than Mumbai, an additional courier fee of Rs 700 will be applicable on Singapore tourist visa fees. Applying for your Singapore visa is a simple process. The documentation is extremely simple. However, there are chances your Singapore visa application may get rejected due to a few reasons that like insufficient documents that should not be ignored while applying. Singapore can surprise you in unusually brilliant ways. Defined by style and panache, a visit to Singapore should definitely be in your travel list. All you need is a Singapore visa and a plan. 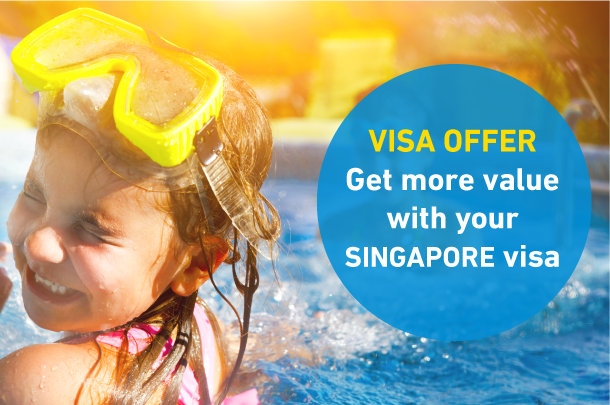 Apply for your Singapore visa with Musafir.com and get ready for a holiday like never before. Why do you need a visa to visit Singapore? Indians visiting Singapore must apply for a Singapore visa before travelling. Obtaining a travel visa means that you are visiting Singapore only for tourism purposes and cannot engage in any other business activity during this period. After the provided period is over, the guest needs to exit the country. What is the validity of my Singapore visa? 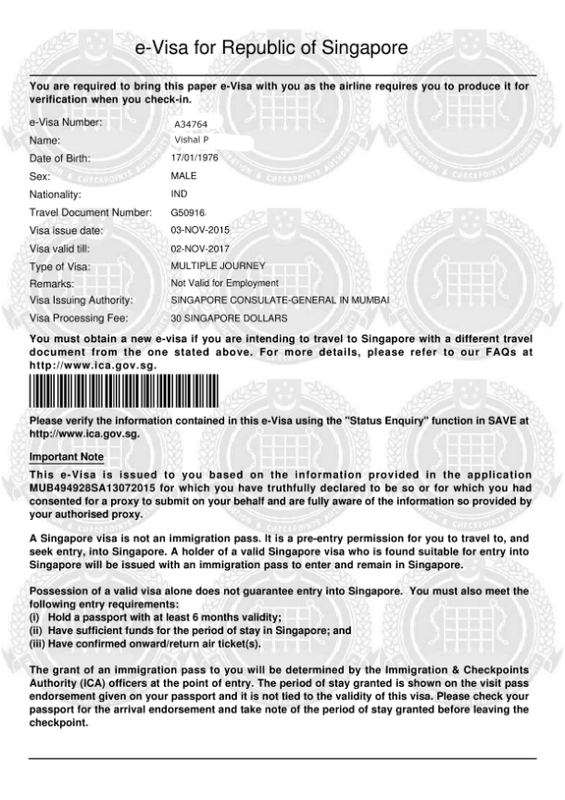 A Singapore tourist visa is valid for a period of 30 days. Once the visa expires, tourists must exit the country as per the immigration rules. What are the Singapore visa requirements? 6) Bank statement reflecting transactions of last 6 months duly attested by a bank official. What are the additional documents required to apply for a business visa? 2) Invitation letter from overseas company addressed to 'The Visa officer Singapore consulate'. What are the different types of Singapore Visa? Business visa is recommended for trips that are commercial in nature and is issued for a specific period of time, i.e. the purpose of your trip is to enter Singapore for a temporary business visit. What are the photo requirements for Singapore visa online? How do I apply for Singapore visa for more than 5 travellers? All group visa requests can be mailed to Musafir.com at easyvisa@in.musafir.com and we will revert to you within 24 hours. Alternately, you can also call us at 022-68311010 with all the passenger details. While sending us the group visa query, kindly include maximum information about your travel. Example: Number of adults and children traveling, date of travel (arrival and departure) and similar. How can I apply for a multi-country visa? You can apply for a multi-country visa by calling us on 022-68311010 or mailing us the details on easyvisa@in.musafir.com. How will I know the status of my Singapore visa application? Musafir.com India will update you through an email after receiving the update from the Singapore Consulate. You can still call us on 022-68311010 or mail us at easyvisa@in.musafir.com to check the updates on your visa. How will I know if my Singapore visa application was successful? Musafir.com India will email you the the status of your visa application as soon as we get an update from the Singapore Consulate. Please note: Musafir.com India cannot guarantee a successful visa application. It is subject to the respective government rules and regulations. How will I receive my Singapore visa? Singapore visa is in the form of paper visa and will be sent to you once we receive the same from Singapore Consulate. How do I cancel my Singapore visa application? Once you have submitted your application for Singapore visa & made the payment, it cannot be cancelled. Can I amend/modify my Singapore visa application after payment? We do not allow any changes/amendments or any kind of modifications to submitted Singapore visa applications. Moreover, Singapore visa application charges are non-refundable. See how your Singapore visa will look like! Have queries related to your Singapore visa? Look no further! Musafir.com provides Bahrain visa assistance in Mumbai, Bangalore, Chennai, Kolkata, Hyderabad, Pune, Lucknow etc. Singapore has a lot to offer and navigating through those waters can get tricky. So here's a Singapore guide to help you out. From restaurants to adventure to nightlife, you'll find it all here. Know more about Singapore travel guide. Singapore a sprawling Urban city, lies between the Indian Ocean and the South China Sea on the eastern tip of Malay Peninsula. Of the limited city-states you’ll find in the world, Singapore in one of them. Singapore is a such a destination that every traveller’s heart will find satisfaction. Tourists and travellers are treated like kings and queens here. You’ll feel the unique experience right from the get go. Singapore’s Changi Airport is one of the busiest airports in Asia. The airport offers a number of engaging activities for kids as well as grown-ups. From a spectrum of spas, nature trails, swimming pools, amusement parks and hotels there are a horde of activities for fun, entertainment and much more. The airport is just the beginning though. All the fun and luxury you find at the airport is just a small peek into everything Singapore holds. If you’re looking for reasons to visit Singapore, there are many. Nobody takes care of their traveller’s entertainment needs better than Singapore. For families and kids, Singapore has Universal Studios, Adventure Cove Water Park, Night Safari, Zoo, Jurong Bird park, the list just goes on. For couples looking for some fun, the Singapore flyer is perfect. The nightlife of Singapore is definitely something you need to experience. Singaporeans definitely know how to throw a happening party. That’s not all, the food and culture of Singapore is so vast and varied, one can write pages on it. Singapore shows a mix of great cultures. Little India, China town, you’ll find it all here. And of course shopping! Shopping is synonymous with Singapore. There’s really nothing that Singapore can’t offer. Everything you might want and need, Singapore has it. Including things you never thought you needed! It is generally hot and humid in Singapore all year round. However, from November to early March, the weather is pleasant and it gives you a lot of scope for outdoor activities. The tourism industry of Singapore reported record breaking numbers in 2018. Tourist arrivals from around the world in Singapore witnessed a growth of 6.2% in the year 2018, and an overall 16% growth in tourists from India.